Texture will be best when freshly made. Try dried cranberries or chopped nuts instead of raisins. In a medium bowl, mash bananas with a fork until mostly smooth. Add oats, cinnamon, vanilla and raisins. Mix well. Drop spoonfuls of dough onto lightly sprayed or oiled baking sheet. Flatten with the back of a spoon or bottom of a drinking glass. Bake 10 to 15 minutes. Remove from oven and let cool before serving. 2 Comments for "Banana Oatmeal Cookies"
YES!!! SO GOOD!!! Will make these "cookies" a lot for the kiddos - no sugar so no "sugar highs" and sneaking in fruit + whole grains, plus fast! They were even crisp which isn't always the case with lower fat cookies. Now I will always have the perfect way to use up ripe bananas :)! BUT they taste best if they are eaten right out of the oven! Finally got around to trying this recipe. Looks different because there is no eggs, flour or sugar. But was surprised how good they were, and not sticky at all! So easy to make, good for using up overripe bananas. Making them for a school tasting, hopefully the kids will like them! 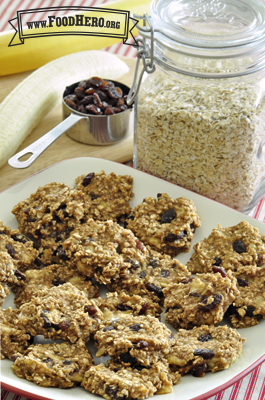 Tips: If large bananas, add another 1/4 cup of oatmeal (can use regular oatmeal, just put in blender for a few seconds); also, don't use the insulated type baking sheets, the cookies don't cook well on the bottom. Flatten the cookies pretty thin before cooking, I baked for 13 minutes. They would be great for a hiking snack!